The Emergency Room is one of the most active departments within a hospital. Patients come in during all times of the day and night with a variety of different illnesses or injuries. Throughout the various scores of events that take place, from Triage to departure, patients are moved around and seen by numerous hospital caretakers to determine their condition. With the workload of staff increasing and the importance of patient experience and satisfaction rising, it is imperative for hospitals to create more streamlined processes that eliminate wasted time and steps within the Emergency Department. According to the American Hospital Association, the top causes of poor patient flow are communications and visibility of data. By implementing Real-Time Locating System’s (RTLS) tracking devices for hospital staff, patients, and assets you can eliminate many manual processes and enhance patient flow for better patient care. Staff tracking: RTLS Staff badges identifies the location of staff whereabouts throughout the ED. Badges provide staff presence validation, streamline workflow, and time-stamp exact location via maps on AV monitors with accessible viewing for staff. Nurse call integration can help enhance staff-to-staff communication by connecting calls through wireless phones which speed up standard call procedures with the push of a button. Nurse call phones help with faster patient response times and reduce noise by eliminating overhead paging to keep the ER calm for already stressed patients and families. Patient location: Patient tags help monitor where a patient is at all times. RTLS tags can help expedite patient response times, and optimize the patient flow process with automatic reminders. Staff can observe patient locations and waiting times via monitors at workstations to ensure the patient has been assisted by a caregiver in a timely manner. Tags also help staff locate wandering patients who leave bays or rooms without approval and get them back to where they need to be. The movements of each patient (from entry into the ER, admittance into the hospital, until departure) is automatically updated to their electronic record with the exact dates and times for hands-free documentation. Equipment and asset tracking: When staff are under pressure, they don’t have time to waste running around looking for patient monitors, trays or other equipment. With asset tags, equipment in the ED are tracked to show exact location for immediate recovery and use. During critical cases, crash trays need to be located immediately for patients, with no time to spare. Asset tracking can capture exchanges between equipment within just a few seconds, speeding up the workflow processes, to provide faster, better care for patients. 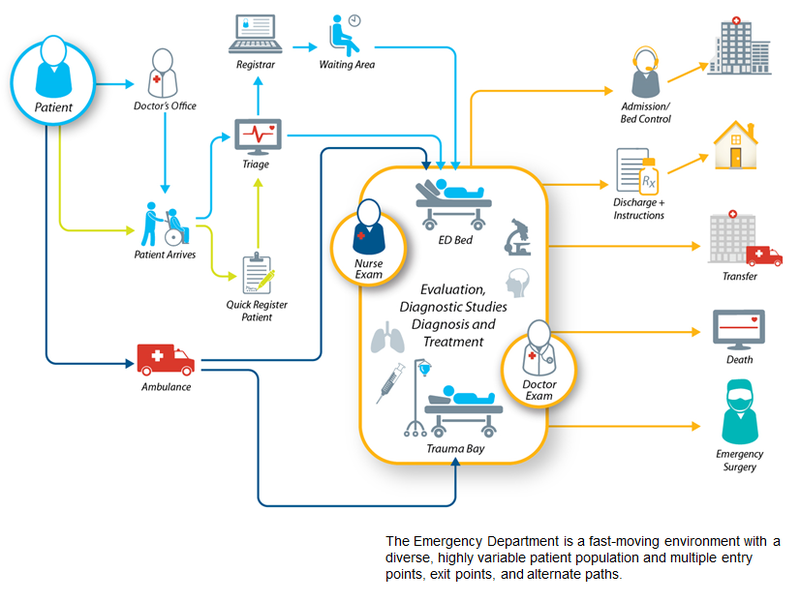 The integration of RTLS within the Emergency Department is thorough in advancing workflow processes, patient flow and reducing response times. It enhances staff communication and gives more visibility of patients in a fast-paced environment where time matters.